Exhibition is in three days. Here is a photo of the board conveying what needs to be done. Today in physics had work time. The due date for getting all blog posts and revisions in is WEDNESDAY, DEC 14! Brian says if you need more time talk to him before then. On quatumquasars.com, you can see what each blog post entails for your revisions. Be sure to work on you research paper as well. What is a cow's favorite Disney movie? There are only two more weeks until the end of the semester! Since we have not done any new lessons in the past week, here are some important due dates to keep in mind. December 15, exhibition. 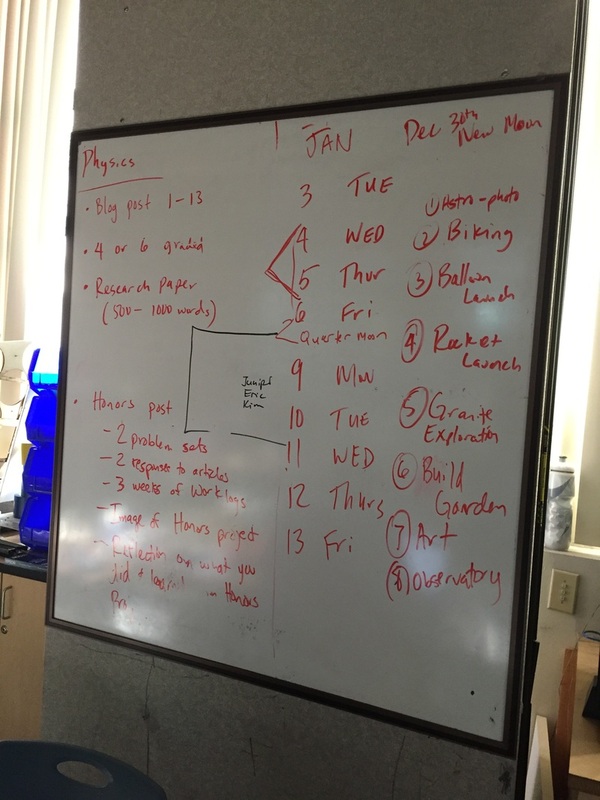 December 14, everything due (blog posts, revisions, etc.) Important assignments due soon are the research paper and semester reflection (Final Blog Post 13), and the films. quantumquasars.com (Brian's Blog) has lots of useful information as well. Never trust an atom they make up everything! Be sure to finish your physics blog post by Monday. If you are in honors physics, be sure to do the honors post as well. Details for this are on quantumquasars.com, Brian's Blog. Today is the 20th physics post. Has time gone by so fast or what? We had mainly work time in physics, we only have three days in this week so be sure to be productive! Blog posts are recommended to be requested for critique by this Friday, to do this simply email Brian. Your research paper is due in five weeks. The information for blog posts is on quantumquasars.com. This week's physics and honors post is due Monday. I apologize for the missed posts due to the astronomy camping trip. Your physics blog post is due Monday! On quantumquasars.com you can find the details. Your research paper assignment is posted. Pick one bullet on Brian's blog and elaborate on it for the paper. It is due in five weeks. All of the videos we watched in class are on Brian's blog! Congrats to the weather balloon group on your launch! Congrats to the astronomy group for gathering cool photos! Though I missed the morning today, the entire afternoon was work time. New announcement! The research paper assignment is posted on quantumquasars.com. Below is the assignment. Also, important note--> Permission trips for the camping trip must be signed tomorrow. Over the next six weeks, you must complete a research paper on one of the following questions within your capstone group. Everyone must complete a 500 – 1000 word research paper, double spaced. Use the graphic organizer from Mike’s class. The thesis of the research paper will be the main idea of your paper and you should use three to five sources which correspond to each claim box on the organizer. What is entropy? Why is it significant to our understanding of the universe, time, the processes around us and the fate of the universe? How do stars create light? How can we read that light for information about what’s happening in the star or nebula? What is the relationship between focal length, aperture, and an object’s apparent magnitude in the night sky in order to gather data about the object? What is gravity? Why has it been called the cosmic sculpture? What is the ISP of a rocket fuel and why is it significant? Compare the impulse of sugar fuels, sugar grain and black powder. Compare the materials used in the Phoenix 1 rocket. What are the advantages of aluminum, stainless steel, a silicon O-ring and a plastic nose-cone? Why use these materials? Why is the nozzle so significant to rocket performance? What is the atmosphere and why is it significant? What is the magnetosphere and why is it significant? What is DNA and why is it significant? What is it about the nature of water that allows for the formation of complex molecular structures and life itself? What is the ecosystem of the San Diego regions and what are the challenges we face? What is light and how is it captured in film? Today in physics we had project work time. 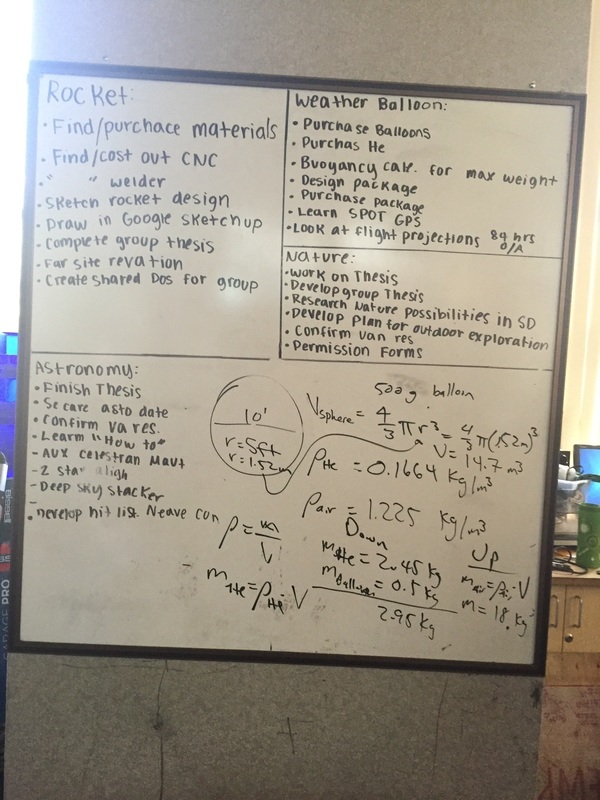 Earlier in the week I mentioned writing instructions for how to find the upward force of a weather balloon. Here they are. First find the radius of the balloon in meters, next use the radius to find the volume of the sphere. The equation is 4/3πr^2. Next find out how much helium is in the balloon. Use the mass of He = He's density times volume formula. The density of He is 0.1664 kg/m cubed. Then find out the mass of air displaced. Use the same formula as above, but replace the value of He's density with the density of air, 1.225 kg/m cubed. Now, add up all of the downward forces, but be sure they are all in kg to stay consistent. Remember He's mass counts as a downward force. To find the upward force, subtract the downward forces from the mass of air displaced. This number is your upward force, to convert it to Newtons, multiply it by Earth's Gravity, 9.81 m/s square. To find the acceleration, use the upward force, in Newtons for F, and the downward force for m, in the F=ma equation. Solve for a algebraically. This is how to do the problem set. It is due Monday along with the rest of your physics blog. Today in physics we have project work time. There are individual tasks for each group. Here is a photo of the group schedules. Physics blog posts are due Monday.